CLICK here for the March 2017 Newsletter! In this strange lull between the Xmas holiday and New Year’s Day, we usually drift in nostalgia and reminisce about the past year’s activities and achievements. And though there have been many wonderful accomplishments this year, we find ourselves looking forward to 2017. We are ready to roll up our sleeves and take Autistry to the next level – opening the Autistry Comprehensive Adult Program, launching creative social enterprises, and creating a Mentor Training Program for professionals and families. 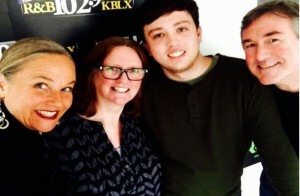 Last week, Dan, Steven, and Janet were interviewed by radio host Sterling James for her KBLX Cares program. We were very impressed with Steven who insisted he was not articulate enough to be on the radio – and yet he spoke with eloquence and confidence. Steven graduated last year from Sonoma State University with a degree in Applied Mathematics. He is bright, funny, creative, and autistic. Listen for yourself! In November, we wrote about the Saturday and Sunday Core Workshops. These workshops are for teenagers and are held on the weekend to not interfere with middle and high school schedules. The Thursday and Friday Core Workshops are for adults. Our adult students range in age from 19 to 50+. Their verbal ability ranges from virtually nonverbal to oh-my-God-please-be-quiet! How do we accommodate such a wide range of interests and abilities? By addressing each individual’s needs and connecting with each individual’s interests. We challenge our students to expand their capabilities and we challenge ourselves to be open to learning new skills with our students. The range of projects is a reflection of the range of interests. Danielle is creating mixed media pieces. She has learned to use the laser cutter to create complex shapes and she also incorporated her love of double spiral lanyards. 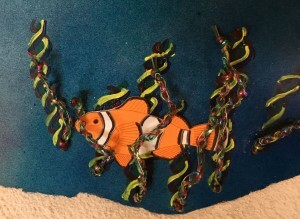 The lanyards became a coral reef and the perfect environment for a clown fish. 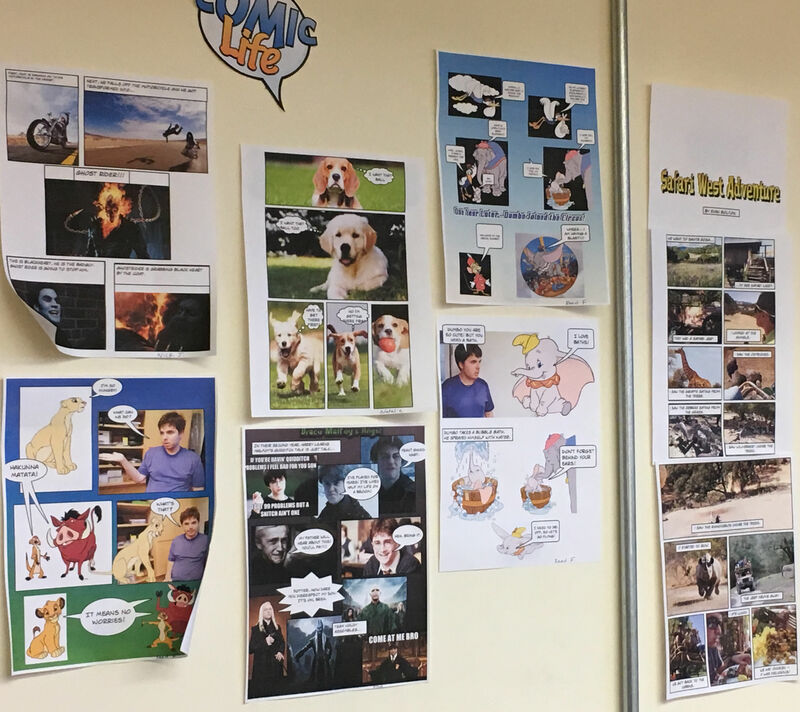 Several of our students are expanding their storytelling ability with ComicLife. This simple-to-use software program allows them to create visual narratives and add short descriptions and dialogue. 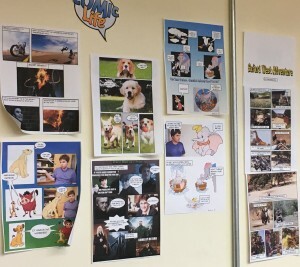 Creating comics gives those with limited verbal ability the opportunity to share their stories. It also encourages the development of vocabulary, perspective-taking, and organization. Over time these stories become more and more complex and lead to stop-motion animation. Stop-motion is a wonderful way to experience drama. The process can be tedious but the rewards are great. Over the years students have created several films incorporating stop-motion elements or entirely done as stop-motion pieces: Screaming Eggs, Ian and Reed Juggle a Star, Fish Hook, Thomas the Tank Engine (test), and Alphabet Mission to Mars! Some of our students are already fine writers. On Friday, Gabrielle Haggett-Molina facilitates the Autistry World group. The Autistry World Group is the creation of Sara Gardner, LMFT our Clinical Director. She felt that the inner-worlds of our students needed an outlet and peer support. 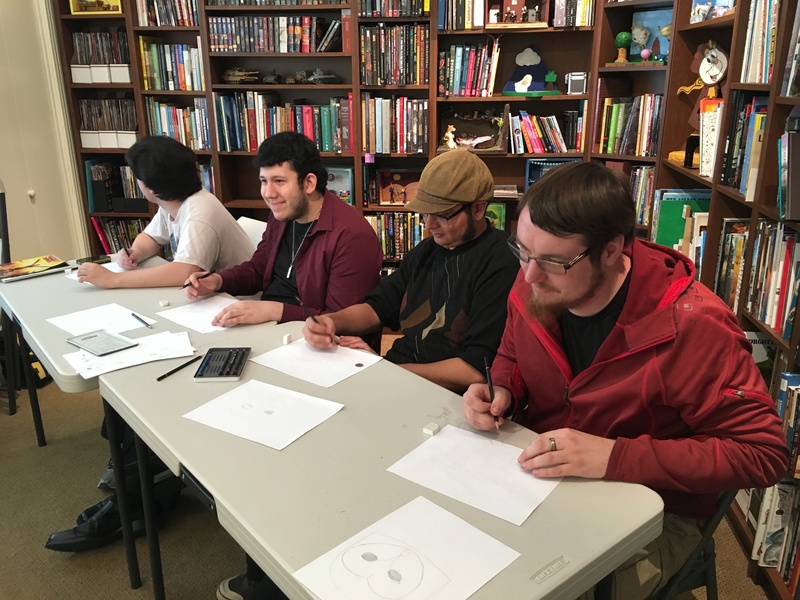 Each member of this group is creating a unique imaginary world. Their projects can be novels, board games, video games, graphic novels, or even blogs. They share their works-in-progress with each other in group and also online throughout the week. Several of our adult students are taking college courses and we will be expanding our college support services in 2017. One of the most important lessons we have learned over these last 8.5 years is that everyone, autistics included, when given the opportunity will continue to grow and learn throughout their lives. At Autistry we are firm believers in lifelong learning. Our adult students (and our teens!) need employment experience. We are reaching out to the community to find appropriate opportunities but we also realize the need for creating those opportunities. Dan recently posted a blog about social enterprises and how they can offer hands-on experience to autistic individuals. In 2017 we will launch a couple of light-manufacturing social enterprises. These will offer experience designing, building, and marketing products to the public. Wow – there is a lot of work ahead. Please consider a donation to help us fulfill our goals and enrich and empower the autistic community. More information is available on our Donation page. We look forward to connecting with you all in 2017! This entry was posted by Janet Lawson, MFT on Monday, December 26th, 2016 at 2:58 pm	and is filed under Studio Newsletters. You can follow any responses to this entry through the RSS 2.0 feed. Both comments and pings are currently closed.